“I want a idermon,” Silas said. “Oh! You already ate your vitamin today,” Gammy replied. The trio attended the show, “Charlotte’s Web,” performed live in Old Sturbridge Village’s Freeman Farm yard. When Silas and Gammy peeked through the fence slats, they saw two little pigs playing in the mud. The pigs splashed and splattered while rolling around, then their “stinky mud” flew up into their faces. Gammy agreed. It was as yucky as could be. “I didn’t like that, Gammy!” Silas exclaimed. “Neither did I,” Gammy agreed. “That was the last book, Silas. Now it’s time for bed,” Gammy said. “Kettle? Oh! Cuddle,” Gammy figured out. Gather knowledge and store it away. Listen. Learn. Absorb. Observe. Papa drove Silas and Gammy around Spencer and Sturbridge, Massachusetts, where deer were spotted along with some families of wild turkeys and Canada geese. Silas often burst into song with: “Old Mac Donald had a farm, ee-i-ee-i-oh.” “I’m a little teapot short and stout” came up quite a lot. “The itsy bitsy spider” and “The Farmer in the Dell,” “Abcdefg . . . Won’t you come and play with me?” followed. He painted pictures and happily played with his favorite toy—Thomas the Train. Once upon a time Gammy heard a loud noise and a big “crack.” “Boom!” What was that noise? What could it be? A gaga? She turned on the light on the deck outside and what did she see? A bear on the deck drinking the hummingbird juice and thinking it was very yummy. She woke up Papa who was as asleep. 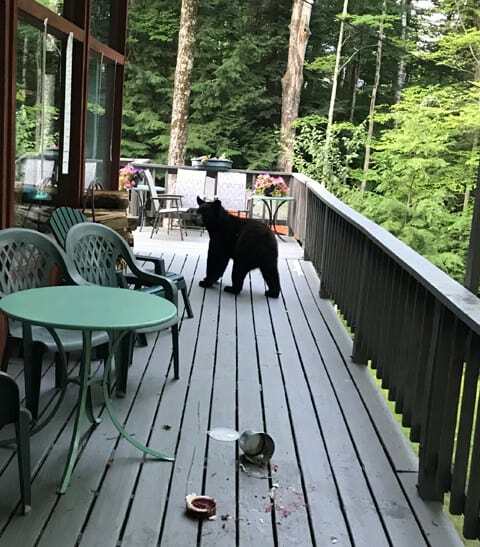 Papa took a picture of the bear on the deck who was gobbling up the wax in the citronella candle. Gammy rang the dinner bell. As the hungry bear walked away he spat out the citronella. 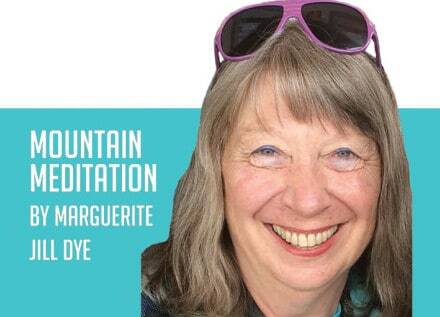 Marguerite Jill Dye is an artist and writer who divides her time between Vermont and Florida’s Gulf Coast.